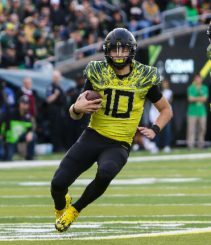 Justin Herbert is a great addition to the team, but it’s not because he’s from Oregon to start with. 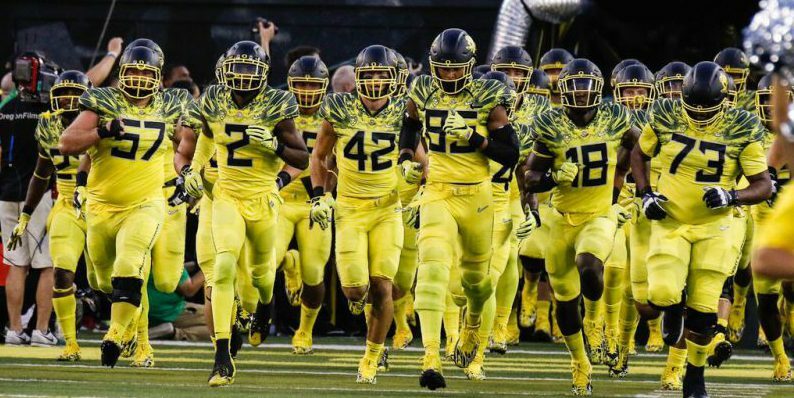 The argument goes something like this: Since the state of Oregon produces so few elite athletes, when they do come along, they simply must become Ducks. Otherwise, the Ducks are in big trouble, with all of the huge recruiting disadvantages they have to try to overcome. Don’t get me wrong. It’s great when an in-state athlete works out well. I’m a huge Justin Herbert fan, and who wasn’t thrilled by the way Joey Harrington repeatedly pulled victory out of the jaws of defeat? What’s more, by all accounts, both are just great human beings. But I’m also a fan of Dan Fouts and Marcus Mariota. And the common denominator is NOT that they all attended high school in the state of Oregon. Building a wall around the state to keep the best athletes in is simply not feasible. True, there are those athletes who want to attend college close to home. It’s familiar. It’s handy for their family and friends to come cheer them on. And it’s easier to perpetuate a high school romance, if that’s a priority. But not everybody wants that. To some, it just doesn’t mean that much. And to some, it’s exactly what they don’t want. They see going to college as an opportunity to get out in the world. See what it’s like to live in a different part of the country. Explore the unknown. There’s nothing wrong with that, and there’s nothing inherently different about prepsters from Oregon that exempts them from the possibility of feeling this way. Let’s get back to the basic premise, though: the idea that Oregon has a huge recruiting disadvantage. It’s total B.S., and I’m not talking Bachelor of Science. There are good reasons, ho-hum reasons and wrong reasons to select a school. And Oregon’s “disadvantages” fall in the latter two categories. 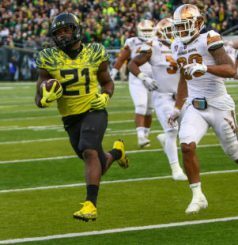 Royce Freeman, like most Ducks athletes, is not from the state of Oregon. For an athlete who considers sports a high priority, getting the best coaching possible has got to be the most important consideration. Having great facilities and knowing that the athletic program is highly supported by the college and the community are not far behind. For the athlete who sees past the next four or five years and is not completely counting on a professional athletic career, academic curriculum is also an excellent consideration. Then there are the ho-hum reasons: close to home, nice weather, parents went there, like the school colors, the mascot, the uniforms. And then there are the wrong reasons. Probably the worst reason to select a school is to base a decision upon how great the distractions in the area are. Hollywood. Bright lights. Beaches. All that a big city has to offer. As my college coach told us, in college you have three opportunities. You can excel in your sport. You can do well in school. And you can have a great social life. Choose any two. The point of all of this is that the University of Oregon has a huge recruiting advantage for everything that really matters, outside of not providing the opportunity for certain specific academic curriculums such as engineering, motion picture studies and animal husbandry. Oregon has one of the best-funded athletic departments in the country. Ironically, there are fans of other schools who call Oregon “Nike U,” thinking that they’ve come up with a clever insult. So, spawning the greatest athletic equipment company in the history of the world is a bad thing? Oregon’s commitment to maintaining elite coaching staffs across the board is unquestionable. And there is no other community in the Pac-12 that supports its university’s athletics at the level Oregon does. Oregon really has only two recruiting disadvantages. First, it’s not located in a recruiting hotbed. This means that it’s not going to be a great fit for very many athletes who want to stay close to home. That’s okay. 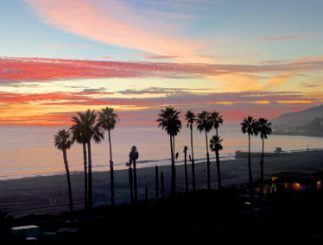 There are plenty of top athletes who are perfectly willing to pull up stakes and spend some time in another part of the country. Malibu is closer to the UCLA campus than the stadium where the Bruins play football, but Jim Mora is closer yet. And second, Oregon admittedly does not have the distractions of Southern California’s warm water beaches and Hollywood, Seattle’s famed phallic tower, the Bay Area’s Fisherman’s Wharf, Utah’s Mormon Tabernacle Choir, the sheep herds of Corvallis, the police line-ups in Pullman, and whatever they do for fun in Arizona. Like maybe play football when it’s 119 degrees. But while all of these distractions may sound great to recruits, the truly dedicated student athlete just isn’t going to have time – or care. Nationally – and even internationally – an abundance of athletes see Nike U as a great sports/study camp to spend four or five years. Oregon men’s and women’s basketball have a total of one athlete each from the state of Oregon. The highly successful softball team has zero. It’s been a while, but the last time I looked, Oregon’s football roster included players from 26 states. So it seems a little hypocritical to expect high school athletes from Oregon to stay in-state for any reason other than it just happens to be the best fit for them personally. It’s a bit of a bummer when someone like Elijah Molden goes to the dogs, but there will always be out-of-state athletes like Deommodore Lenoir and Jaylon Redd to more than make up for the emigration from the state. Oregon is a national brand. Local sales may make for feel-good stories, but it’s the character and talent of the athlete, not where he — or she — went to high school, that really matters.